Gili Getaway Fast Boat is the only Boat to Gili Trawangan from Bali and back, Gili Gateway fast boat service leaves Serangan Harbor and goes direct and non-stop to Gili Trawangan. 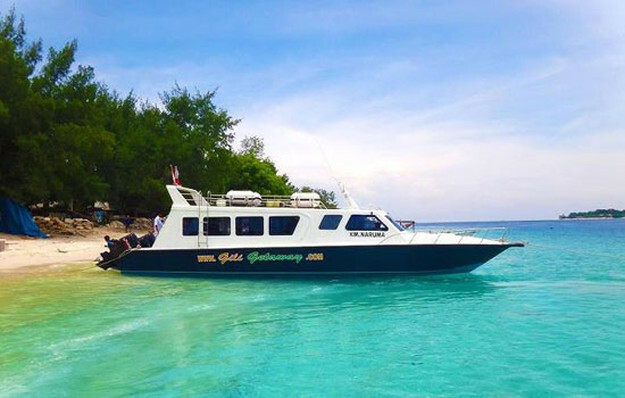 The fact is that there are a number of fast boat services for transportation from Bali to the Gili Islands and Lombok, however Gili Getaway Fast Boat is the only Boat to Gili Trawangan from Bali and back. Our fast boat service leaves Serangan Harbor and goes direct and non-stop to Gili Trawangan. This entire trip takes approximately two hours to two hours and 15 minutes and is dependent upon the conditions at sea. Our Gili Getaway Fast Boat stops in Lombok or Gili Air once we have dropped off the guests from Trawangan, however it can be expected to always travel direct between Gili Trawangan and Bali. When you travel on a Gili Getaway Fast Boat, you will also always receive onboard refreshments and chilled towels. In addition, upon check-in, you will find restaurant facilities, clean cars complete with air conditioning, knowledgeable drivers who are as friendly as they are smart, and a sunroof for enjoying the gorgeous archipelago sun. Sometimes the Lombok Strait can prove treacherous for any fast boat service going from Bali to the Gili islands. On some very rare occasions, our Gili Getaway Fast Boats are unable to run because of safety issues, but you can be sure that Gili Getaway will make every attempt at making this minor inconvenience less painful for our passengers either by a re-schedule of your departure or by arranging alternative transportation to Lombok, the Gili’s or Gili T. Making your Gili Getaway Fast Boat trip as stress-free and pleasant as possible is our main goal. The Narooma is a high-powered speedboat that boasts three 250hp engines and has the capability of transporting passengers to their island getaways at a speed that gets them there one hour quicker than any of our competitors. This means that that we provide a reasonable pick-up time so that we can transfer you to Serangan Harbour on your holiday schedule. Gili Getaway have a brand new custom-built fiberglass speedboat that is truly deluxe and measures 15m/45 feet. This luxury craft was designed for handling unpredictable water conditions in the Lombok Straits. This new vessel increases the standards for Boat to Lombok from Serangan Bali service. Four four-stroke 250 hp Suzuki outboards equip this deluxe speedboat for speed and comfort. In addition, she comfortably seats 35 passengers on her spacious cushioned seats complete with Sunbrella fabric. These luxurious seats are a full 1.3m/4’ wide, and there is stowage under the seats for small traveling bags. Personal earphone ports onboard complement the available televisions for watching movies while traveling. A state-of-the-art GPS tracking system can also be watched on the monitors, so that passengers have the ability of tracking their progress and keeping informed of the amount of time left in their journey to their destination. Also onboard is a massive restroom complete with a window that opens, electric flushing toilet that is full-size, mirrors and luxurious granite countertops. So a visit to the restroom on a Gili Getaway Fast Boat is not an inconvenience, but a pleasure, and is always complete with fresh water the whole time. We may not be the only fast boat with a sundeck, but we do have the most comfortable one with personal padded cushions and back supports. Inside those back supports are storage units for storing personal items like Kindles, phones and musical devices. If having the wind in your hair is your cup of tea, but you don’t particularly care for the hot sun, you’ll also find aft exterior covered seating. This area is completely covered and protected from the elements. All-in-all, thanks to effective safety equipment and adherence to the international safety standards, at Gili Getaway Fast Boats, we are proud to be providing safe high-speed transfer onboard our deluxe class boat to and from Bali, Lombok and the Gili’s.